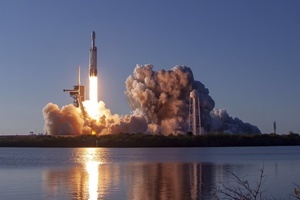 SpaceX managed an impressive feat when the core booster from its latest Falcon Heavy rocket launch landed on a drone ship at sea, but unfortunately it did not make it back to port. Last week's SpaceX launch was technoligically and visually stunning as the rocket firm managed a synchronized landing of two side boosters that separated from the core in SpaceX, and then managed to land the core booster on a drone ship at sea. This was only the second time SpaceX flew a Falcon Heavy rocket, and the first time it managed to land all three boosters. The side boosters were intended to be reused with the very next Falcon Heavy launch. Given that the side boosters are essentially modified Falcon 9 boosters (in fact the first demonstration launch used two previously flown and landed Falcon 9 boosters as side boosters), the design has a track record of success in landing and re-flight. However, the core is a more fortified, tougher version of the Falcon 9 booster and so has landed successfully only once, and therefore would likely not have been reflown but probed by SpaceX engineers instead. Unfortunately, while the core landed upright on the drone ship, it never made it back to port. Choppy seas meant that the upright core booster eventually fell over and was lost to the sea. While this is a disappointment for SpaceX, it doesn't take away from the achievement of landing it in the first place. The rocket firm said that it would not compromise on the safety of its workers in recovery operations. It does not anticipate that the loss will affect future missions in any way.